One of the most interesting places we visited on our trip to Israel was a recent archaeological excavation near the town of Omrit, in the northernmost part of Israel. Newly discovered ruins there have placed this as the location where the main traveled road through Israel turned northeast out of the Jordan River Valley towards Damascus. Archaeologists had never known the exact location of the Damascus Road that Saul was on when he was met and blinded by the Lord Jesus. An ornate temple complex to Caesar Augustus and elaborate colonnaded streets and shops confirm that this was the “doorway” into Israel from the North. This find made for an exciting visit for the New Testament believer because you could imagine this as a place that Saul came by on his way to persecute Christians in Damascus. Just a few miles north and east of here he was blinded by a light and heard the audible voice of Jesus speaking to him. This is one of the seminal events in Christianity and Saul’s life was completely changed by this miraculous encounter. Sitting in the temple ruins, near the paved street running to the northeast, we read Acts Chapter 9 out loud and heard the story of God calling Saul to be His chosen instrument to get his message out to both Jews and Gentiles. There is a tendency to think of Saul’s Damascus Road experience as a unique and isolated event that God put in motion. However, if you look at the experiences of almost all the prophets in the Old Testament you will see some remarkable similarities. Because Saul knew all these stories, he would have probably identified with what happened to them when they were being called by God. Let’s look at some of these Hebrew prophets and see what the similarities are. Exodus 3 – At the burning bush, Moses saw a bright light of fire and hid his face in fear. God told Moses, ”Go, I am sending you”. Moses asked God who He was. Also, God called Moses name twice. Ezekiel 1-2 – This is very similar to Saul’s experience. A huge storm with lightning, wind, thunder, and a brilliant light prompted Ezekiel to fall face down, unable to speak. God appeared and spoke audibly and said, ”Go Tell”. Daniel 10 – Daniel saw the Lord in all His brilliance, but the men with him did not see God. Daniel fell face down as God spoke saying, “Go Tell”. Jonah – God appeared and spoke audibly to Jonah and said, “Go Tell the Gentiles”. God appeared in a violent storm and Jonah was plunged into darkness for three days because he was doing the opposite of what God wanted. The point of this little study is that Saul, a devout student of the text (a Pharisee of Pharisees), would have been familiar with all these prophets and God’s call on their lives. When God spoke out of the heavens in an audible voice, calling his name twice, in the presence of blinding lights and shaking earth and terrified companions, Saul knew that he was being called by God to something special! Then Saul, like Jonah, was plunged into darkness for three days! Saul obediently responded just like all the others after being visited by God. He boldly went and told both Jews and Gentiles without fear of what man could do to him! God met Saul on the Damascus Road and commissioned him in a very familiar way, and Saul was equal to those great prophets of old in every way. Although Matthew and Luke also record the miraculous story of Jesus calming the storm, Mark’s gospel gives more details and records Jesus’ words as he spoke to the storm. The story is familiar to us; Jesus tells his disciples that they are going to go to the other side of the Sea of Galilee. While they are crossing, a huge storm comes up and threatens to sink the boat. Amazingly, Jesus is asleep on a pillow in the bottom of the boat! The disciples awake Jesus and plead with him to do something. “Don’t you care if we drown?” they cry out. Jesus rebukes the storm and says to the wind and waves, “Quiet! Be Still!”. At once the storm dies down and it is completely calm. The disciples were terrified even after the sea was calm and asked each other, “Who is this? Even the wind and waves obey him!” Admittedly, this was a great miracle, but they had already seen him heal people of various diseases including leprosy, make a paralyzed man walk, restore a man’s shriveled hand and even drive out demons. Why were they terrified enough in this case to say, “Who is this?” What about this act by Jesus to calm the storm convinced them that this rabbi that they were following was without a doubt the son of God? The answer, as usual, is in the Hebrew text! Jesus showed himself to be God by doing the same things that God did in their Hebrew Scriptures. Let’s take a look. The first connection is from the Psalms, in 107:28. The psalmist, in describing God says, “They cried out to the Lord in their trouble and He stilled the storm to a whisper. They were glad when it grew calm and he guided them to their desired haven.” Then, in Psalm 65:7 it says, “Who stilled the roaring of the seas, the roaring of the waves?” Also, Proverbs 30:4 says, “Who has come down from heaven and gathered up the wind in the hollow of his hands and wrapped up the waters in his cloak?” The disciples knew the Psalms and knew that this man who had calmed the sea must be God because this is what God does! 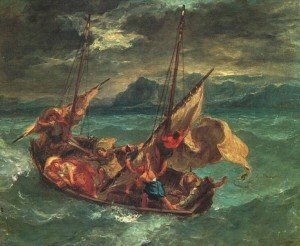 Another story that would have had a huge connection is the story of Jonah. Like Jesus, Jonah is asleep in the bottom of a boat, during a huge storm and the sailors wake him and ask him the same question as the disciples asked Jesus. “Don’t you care if we drown?” In the Jonah story, God also calms the storm. All these same details demand that the Jonah story be part of this God story that Mark records. The third story from the Old Testament that the disciples would have no doubt thought back to, is the Exodus itself. When the Israelites were backed up against the Red Sea and Pharaoh’s army was approaching, the were terrified and cried out to the Lord and to Moses. Moses told the people, “Be Still!” These were the exact words that Jesus used to calm the storm. The Messiah who was to come to Israel was supposed to be like Moses (Deuteronomy 18:15). Because Jesus used the exact words that Moses had used as God’s messenger, the disciples must have made another connection and thought to themselves that Jesus was the second Moses! He is the one who is to come to us, the prophet! To look back to the Hebrew Scriptures that Jesus and his disciples would have known so well is like looking at the same room from a different window. Looking at the New Testament through the window of the Old Testament doesn’t change the story, but it makes it so much deeper and richer. The deeper you dive the deeper it gets. There is so much more in the text than we see on the surface. This story of Jesus calming the storm is just one of the many examples. Why did Jesus pick seventy times seven? Why not just 490 or 78? Was that just an arbitrary number or by using double sevens was he trying to say, infinitely? Or, what about this possibility – was Jesus quoting from an Old Testament text and hinting at something that Peter would have recognized? Now, remembering that the seven is the number for completeness, look at the person who is the seventh person in the bloodline of each side. In Genesis 5:23-24, it says that Enoch, on Abel’s side, walked with God and was such a man pleasing to God (Hebrew 11:5) that he didn’t die, but God took him to heaven (Enoch and Elijah were the only two men in the Bible to do this). In the Hebrew mind, Enoch was the personification of a truly righteous man. 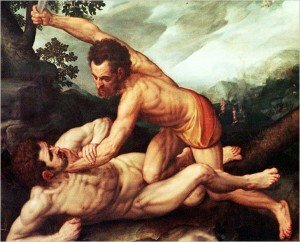 Conversely, the seventh person in the bloodline of Cain (who killed Abel), was Lamech. Lamech was evil personified and boasted in Genesis 4:24, “If Cain is avenged seven times (Genesis 4:15), then Lamech seventy times seven”. Lamech, the most evil man there was, vowed to get even by repaying evil for evil seventy times seven. If we knew our Hebrew Testament background, suddenly Jesus answer to Peter’s question makes sense. Lamech’s vicious announcement of personal revenge finds its counterpart in Jesus response. Jesus, by hinting at this story that Peter would have been very familiar with, told Peter that you can’t fight evil with evil (Cain’s side) because evil will always win. You need to take the path of Abel’s line and forgive seventy times seven. You have to fight evil, every time it surfaces, with good. There is no limit (seventy times seven) to the times that you should forgive. There are so many examples in the New Testament where we think Jesus is coming up with these new sayings, when in reality he was just quoting from his Hebrew text. Our problem is that we don’t know the Old Testament well enough to realize that that is what Jesus is doing. He was the greatest teacher who ever lived, not only in the spiritual sense, but as a man like us who studied and memorized the Text. Everything in Jesus’ life and ministry was taken out of the scriptures that he knew so well. We need to start reading our New Testament through a different window and realize how brilliantly the Old Testament is woven through the stories of the New. It is all one story, we just have to find the connections! We don’t normally think about there being sporting events or Olympic style games during Bible times, but in fact this was the time period when the Olympics began and actually were flourishing. 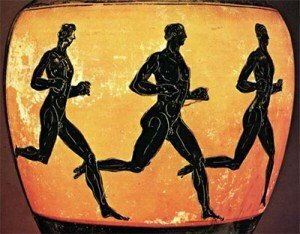 The Olympic Games themselves can be traced back to 776 B.C. in ancient Greece. These ancient games, which pitted Greek city-states against each other, consisted of running events, jumping, discus, javelin, boxing, wrestling, and equestrian (horse) events. The sporting aspect of the games tied closely into the Greek’s religious beliefs. There were always ritual sacrifices to Zeus and the other Greek gods that were associated with the events that took place. The games were held every four years and this time period was know as the Olympiad. Winners of the events were given a garland wreath as a crown. Well-known Olympians were immortalized in poems and statues. The Olympic Games were still very important during the time that Jesus lived. King Herod the Great was himself an Olympian that excelled in fighting, the javelin throw, and in bow and arrow marksmanship. Herod built Olympic stadiums in Jerusalem and in Caesarea Maritima. In fact, Caesarea, Herod’s magnificent seaport city, was dedicated to Caesar Augustus in 12 B.C. by the holding of Olympic Games there. However, I consider my life worth nothing to me; my only aim is to finish the race and complete the task the Lord Jesus has given me —the task of testifying to the good news of God’s grace. …as you hold firmly to the word of life. And then I will be able to boast on the day of Christ that I did not run or labor in vain. You were running a good race. Who cut in on you to keep you from obeying the truth? Similarly, anyone who competes as an athlete does not receive the victor’s crown except by competing according to the rules. In these verses Paul talks about being pressed but not pinned, knocked down, but not knocked out, fighting the fight, finishing the race, running for the prize, pressing towards the goal, and finally receiving the prize. Paul knew that these images would be familiar to his readers and he used them to describe what the pursuit of the Christian life was like. The writer of Hebrews seems to sum up this imagery of life perfectly. The writer spends all of Chapter 11 telling about the men and women who have run the race before us, men and women who finished the race and ran it well, with patience and endurance. Then he sets up the imagery in Chapter 12:1 of a great amphitheater or coliseum, with this great crowd of people who have gone before us, cheering for us, saying, “Come on! You can do it! Hang in there! Keep working at it! Don’t quit!” This crowd is not a crowd of spectators, but inspiring examples of the people that have gone before us. The crowd is made up of our aunts and uncles, grandmothers and grandfathers, and mothers and fathers who have gone before us and run the Christian life well. They are cheering us on, telling us that we can make it, also! The Christian life is a marathon, not a short sprint. It calls for training and discipline in order not to come up short and quit or have to stop and take a break. The picture is of someone training for an Olympic event, every day, giving it all they have. Do we know anyone who is training and disciplining themselves in this way for God’s Olympics? Are we holding back, or are we training our body to make it a slave, as Paul says in 1 Corinthians 9:24-27? Or, are we saving some back for the finish line? Are we treating life more like a walk in the park? Are we running with perseverance the race marked out for us? Will we have to tell God that we still had some left in the tank when we crossed the finish line? Will we have to tell him that we walked or set on a bench for part of the race? Training is not that pleasant. It involves hard work and pain. You have to discipline your body so that it will perform. We are not willing to pay the price as a general rule, to run the race like it should be run. Our forefathers are crying out to us, “Don’t Quit! Don’t give in! You can do it! Keep trying, you can go a little farther!” We must hear what the great crowd of witnesses are saying. They are encouraging us on to our own finish line. Run with passion the race marked our for you! You can do it! The two lowest classes of Roman citizens consisted of “freeborn” and specific types of slaves. “Freeborn” were people of lower economic status, but were born free men and Roman citizens. This class of people was termed, ”Plebians”. There was also a group of freed men, who had been slaves, but had either earned or bought their freedom. They were not entirely free, since their former masters still had some hand on them. Most “freeborn” and “freedmen” were fairly poor, but it was possible for them to achieve some status and wealth in business and trade. There was a synagogue of “freedmen” in Acts 6:9-12. 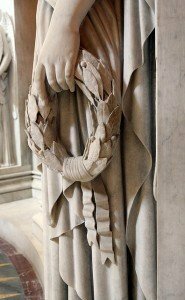 Paul was born a Roman citizen (Acts 22:28), probably from the Plebian class – although there is no way of knowing for certain how Paul’s family became Roman citizens. Certain rights and rewards went along with this citizenship. Among these rights was the right to a fair trial before any punishment could be handed out. This fact enters the Acts story several times. A perfect example of these two classes, freeborn and freedmen, is found in Acts 22:22-29 and is really worth reading. The lowest class in the Roman world was that of a slave. Slaves were property of their owners and were either born or sold into it, often through piracy. A huge trade developed that raised abandoned babies to be sold as slaves. Roman slavery was not racially based and slaves did not have to dress in a certain way. Slaves were a huge benefit to the Roman rulers because they bore the brunt of their industrious building projects. The last group of people that made up Roman society was the soldier. A soldier could come from any of the people groups but were mainly from the poorer classes. A Roman soldier received 225 denari a year, (4 denari a week) and was supplemented in his income by booty taken from captives or people that they had rule over. After completing twenty-five years of service in the military, soldiers were granted full citizenship status and were given 3,000 denari and a good plot of farm land on which to retire. Because of this law, land was soon in short supply around Rome and many of the new countries that were subdued were given to the retiring soldiers. With such a large fighting force, there was a constant need for new lands and this fueled the need to continue to conquer new territories. The soldiers were formed into groups called legions. A legion consisted of five to six thousand men, (depending on the time period in history). Fifty different legions have been documented by historians, and approximately twenty-eight legions were assembled and ready and stationed around the Roman world. A centurion was a commander of one hundred of these men; thus there were sixty centurions in a legion. Centurions wore a colored, plumed crest on their helmets so that they could be seen and followed during battle. There are several centurions mentioned in the Bible. Jesus had an encounter with a centurion in Matthew 8:5-13 and healed his paralyzed servant. In Acts 10:1, a centurion named Cornelius, who was in the Italian regiment, had a dream and called for Peter to come visit him. There are also centurions mentioned in Acts 22:25 and Acts 23:23. A Roman soldier was well equipped and well trained for his job (Ephesians 6:10-20). His issue of equipment was very interesting. They were given crossed sticks that served as a back pack frame to carry all their equipment, which could weigh up to ninety pounds. It had a tool kit, dish and pan and personal belongings. Roman law permitted them to require subjects to carry their pack for them a mile, even if the person was originally going in the opposite direction (Matthew 5:41). They could also force residents to feed and house them for up to three days. They had three weapons: a long wooden javelin with a metal point called “pilum”, a short sword called ”gladius”, and a small dagger called a ”pugio”, for the close-in work. They also carried a curved shield called a “scutum”. They would lock their shields together and advance on the enemy and were protected from any weapons coming in from above. They wore a metal helmet during battle that covered a good portion of their head. 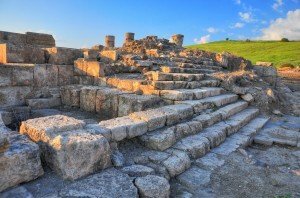 Hopefully, these two short lessons will give us a better idea of the layers of the Roman Society that were present during the time of the Bible. Having this information as we read the Text will help us understand and imagine what life would have been like when Rome ruled the world; the world of Jesus and his disciples.